Garrett's Golf Cars in Greenville, SC! Located conveniently off I-385 at 604 N. Woods in Fountain Inn (only minutes from downtown Greenville! 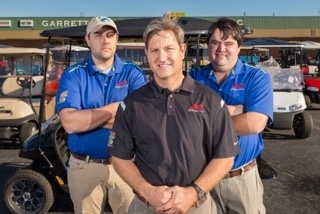 ), Garrett's Golf Cars has become a landmark in the Golden Strip area of Upstate South Carolina after opening its doors in 1992. With 40,000 square feet of indoor space, along with 5 acres of outdoor space, our Fountain Inn Superstore offers a huge selection and variety of golf cars, ATVs, and other specialty vehicles to choose from. In the market for a new or preowned E-Z-Go, Bad Boy (and Bad Boy Off Road), Cushman, or our NEW Tomberlin golf carts, ATVs, or other specialty vehicles? Our Greenville location has you covered! We don't just provide exceptional sales and customer service, of course. We're also happy to customize any cart to fit your lifestyle and family (check out this blog on customization we recently published! ), so just let us know what you're looking for and we'll do our best to make it happen! Our parts, service, and repair department is second to none, maintaining your specialty vehicles with quality worksmanship and a smile. We also have golf cart rentals for weddings, corporate events, and family events,as well as great financing options! We would love to speak with you in person and walk you through how our quality, customer service, and repairs have us head and shoulders over the competition. You can reach us by phone at (864) 862-7709 or contact us online at any time to learn more!